Learn what the Bible has to say about the birth of our Messiah Jesus Christ by reading this collection of inspirational Bible Verses from the King James Bible. And Jacob begat Joseph the husband of Mary, of whom was born Jesus, who is called Christ. So all the generations from Abraham to David are fourteen generations; and from David until the carrying away into Babylon are fourteen generations; and from the carrying away into Babylon unto Christ are fourteen generations. For unto you is born this day in the city of David a Saviour, which is Christ the Lord. And this shall be a sign unto you; Ye shall find the babe wrapped in swaddling clothes, lying in a manger. And suddenly there was with the angel a multitude of the heavenly host praising God, and saying, Glory to God in the highest, and on earth peace, good will toward men. And it came to pass, as the angels were gone away from them into heaven, the shepherds said one to another, Let us now go even unto Bethlehem, and see this thing which is come to pass, which the Lord hath made known unto us. 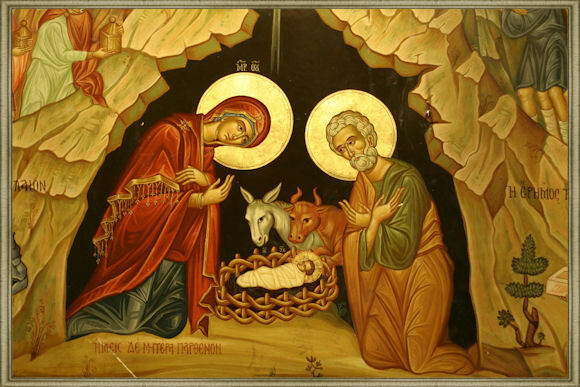 And they came with haste, and found Mary, and Joseph, and the babe lying in a manger. Concerning his Son Jesus Christ our Lord, which was made of the seed of David according to the flesh; And declared to be the Son of God with power, according to the spirit of holiness, by the resurrection from the dead: By whom we have received grace and apostleship, for obedience to the faith among all nations, for his name: Among whom are ye also the called of Jesus Christ: To all that be in Rome, beloved of God, called to be saints: Grace to you and peace from God our Father, and the Lord Jesus Christ. But made himself of no reputation, and took upon him the form of a servant, and was made in the likeness of men: And being found in fashion as a man, he humbled himself, and became obedient unto death, even the death of the cross. Wherefore God also hath highly exalted him, and given him a name which is above every name: That at the name of Jesus every knee should bow, of things in heaven, and things in earth, and things under the earth; And that every tongue should confess that Jesus Christ is Lord, to the glory of God the Father.